This continuing education title explores the history, evolution, rules, and forms of the strategy used to defer tax liability until a later date. 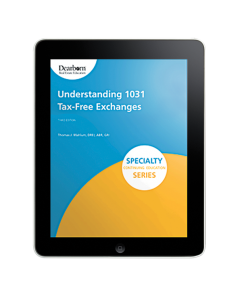 Loaded with real-life examples and calculations, this text allows agents to learn the vocabulary and application of tax-free exchanges so they are better able to answer client questions. A recent review of content ensures students will receive the most up-to-date material.